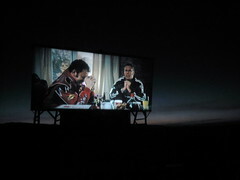 Last night we went to watch Transformers and Evan Almighty at the Wes-Mer Drive In movies. If you've ever been to a drive-in movie, you may recall that they usually offer two movies for one entrance fee. The Wes-Mer is a reasonable $12 per vehicle. Value-minded families will tend to prefer drive-in movies as you get a pretty good deal if you have a large group. You can find out more about the Wes-Mer by visiting http://www.drive-ins.com/theater/txtwesm or just doing a Google search. We had already seen the Transformers and liked it quite a bit. Given the opportunity to watch it again at lower cost was irresistible. As a parent, you should suspend your thoughts about physical proportions and the knowledge that when real cars have collisions, they break into a billion pieces. You'll enjoy the story better that way. You won't leave the theater feeling that you've learned something after having watched Evan Almighty. It's about politics more than it is about God. I would watch it for the humor, but not for anything substantive.